A combination microwave-convection oven, one of the latest innovations in cooking, poses a dilemma for many cooks when it comes to the kind of pans needed for this unusual appliance. The short answer is that it's best to use glass or ceramic cookware, but using these utensils for peak performance takes knowledge and practice. Choosing the proper cookware is imperative for use in a microwave oven. A microwave oven generates a form of electromagnetic radiation. The radiation agitates water molecules in food, which in turn get hot and produce steam that heats the rest of the food. For this reason, microwaves need cookware that won't repel radiation and is less likely to get hot as food cooks. This rules out metal pans and flimsy plastic containers. Cookware labeled "microwave safe" meets three qualifications. First, it won't heat up from absorbing microwaves, although it can get hot from contact with hot food. Second, it's not a container or cover that's likely to melt in contact with hot food. This rules out using margarine tubs and similar containers as well as plastic wrap or other flimsy film as a cover. 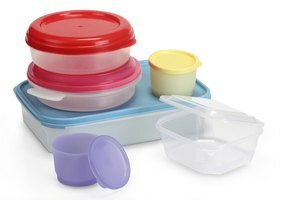 Third, "microwave safe" cookware has no chemicals or toxins likely to leach out in contact with steam or hot food. In contrast to microwaves, convection ovens work by circulating hot air around food. This process speeds up cooking and bakes or roasts food more evenly. Since the goal is to get hot air blowing around the food to cook it, pans for convection ovens should have low sides to allow for good airflow. Also, since convection doesn't use radiation like microwaves, it's possible to use metal pans when only the convection feature is being used. However, the best option is to check the manufacturer's instructions about whether metal pans are advisable. Having two kinds of cookware for a combination microwave-convection oven may not be a cook's best investment in the long run. Glass or ceramic is the best option, but it's important to ensure glass and ceramic cookware be maintained according to their special properties. 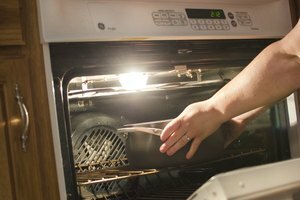 It's been recommended that cooks let refrigerated glass or ceramic pans warm to room temperature before putting them into the oven. Rapid temperature changes can cause cracks, which can lead to the dangerous "exploding glass pan" effect. Sudden cooling can also cause glass cookware and utensils to crack or shatter. 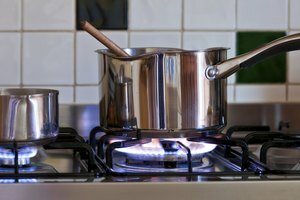 In addition, hot glass or ceramic cookware shouldn't rest on a wet countertop or in water while still very hot. Finally, a good rule of thumb to avoid overcooking is to reduce cooking temperature by 25 degrees Fahrenheit because glass and ceramic cookware retain heat. Clean glass or ceramic cookware gently with cloth or plastic scrubbers in hot, sudsy water. Let pans soak if food has burned on them. If cookware becomes cracked or scratched, discard it to avoid contamination from germs collecting in cracks. Cynthia B. Astle is a longtime journalist who has written on practically every topic of human interest for newspapers such as the "United Methodist Reporter," magazines including "Response," "Arts Ministry" and the "Progressive Christian" and websites such as Darkwood Brew and United Methodist Insight. She was also a food editor and restaurant reviewer for the "Clearwater Sun." What Are the Dangers of Plastic Crock Pot Liners?